The title will probably make you go “WHAAAAAT?!? !”, but I can honestly promise you that this is the absolute truth and this cake came about through my own wants and needs. Here’s the thing: it’s winter, it’s grey and cold outside, I’m in hibernation mode and in need of comfort food. Unfortunately I also need to seriously watch what I eat and the festive season has of course taken its toll. Now, just to be clear, I’m not one of those lucky slim people pinching a little bit of skin on their stomach proclaiming they really need to hit the gym because they’re sooo fat and out of shape. I have a real weight problem which I’ve had since childhood and have battled with all my life. I put weight on extremely easily despite not stuffing my face with sweets or pizzas all week long. I eat a fairly healthy and varied diet including fruits and vegetables, fish and meat, small amounts of cheese and the odd Indian or Chinese takeaway (I’m talking once every couple of months here), I have my coffee black and drink herbal teas instead of sweet fizzy drinks. Contrary to popular belief, being overweight isn’t always the result of making ridiculously obvious and stupid food choices. I am, however, an emotional eater. That means that when I feel low or full of anxiety, I turn to food. It doesn’t have to be “bad” food, but can be anything that will suppress those feelings which often means that I might simply eat too much. Even healthy options can become unhealthy when the portions are too large and of course it still all adds up and ends up on my hips/belly/bottom… Anyway, long story short, I need to lose weight without feeling like I’m completely depriving myself of every little pleasure. Because that’s what food is to me: pleasure, not just merely fuel. With all the above, it will come as no surprise to you that I love cheesecake. 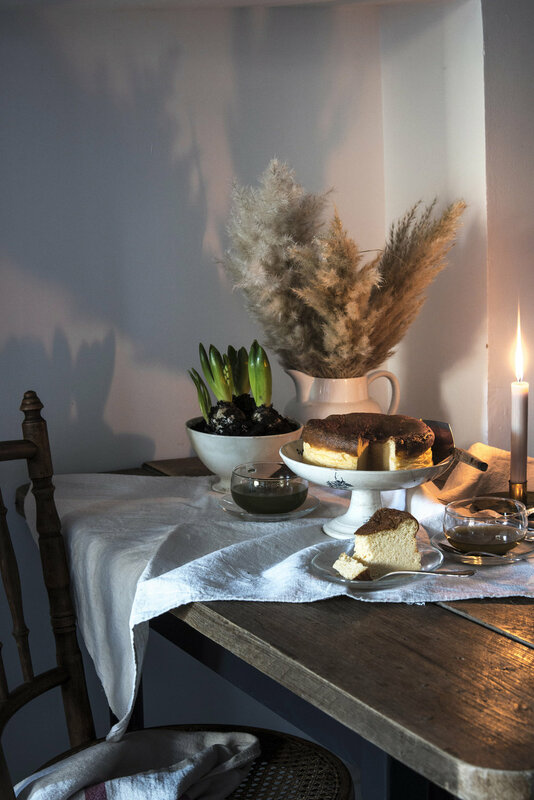 A lovely piece of comforting, smooth and creamy cake eaten by candlelight on a grey afternoon - it doesn’t get much better. This got me thinking: I’ve always wanted to make a Japanese Chiffon Cheesecake, but was put off by the butter and full-fat cheese content, not to mention the sugar! So, I started to look into alternatives and to experiment by simply leaving things like butter out. Then I decided to swap flour for ground almonds and sugar for stevia leaf granules to lower the carb content and help with any blood sugar issues. The result is better than even I expected and is so low in calories, fat, and carbs that I can easily incorporate it into my healthy eating regime. And it actually tastes like cheesecake as well! And just to prove my claims, I entered the recipe into a clever nutritional value calculator the results of which you can find at the bottom of the post.